Venezuela, and throughout the length of the Amazon to near its mouth in Brazil. They are found in small streams, rivers, and lakes, but never in the Amazon itself. They always live where there is protection and the water is still or slow-moving. The water where they are found is very clean, warm, and has similar chemical properties throughout their range. Outside of Amazonia, discus are probably available in your own neighborhood pet shop. They are popular worldwide. Many pet shops carry different varieties of discus. They are also widely available through mail order from discus specialists and private breeders. 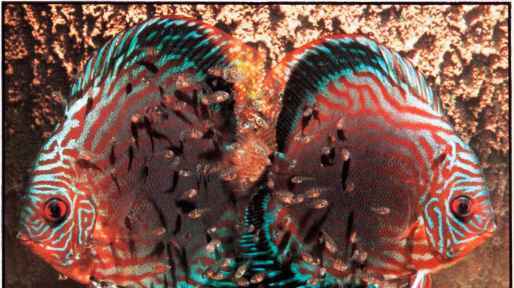 Don't be in a hurry to choose, once you start looking for discus you will be surprised by rif '•< " "
Dr. Herbert R. Axelrod, discoverer of all of the subspecies of discus, always has time to visit discus establishments to keep up with the new innovations. how plentiful and attractively priced they can be. 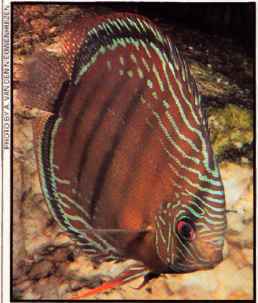 You will find advertisements for quality young discus in Tropical Fish Hobbyist magazine and discus specialty publications. Some of the Gan discus. 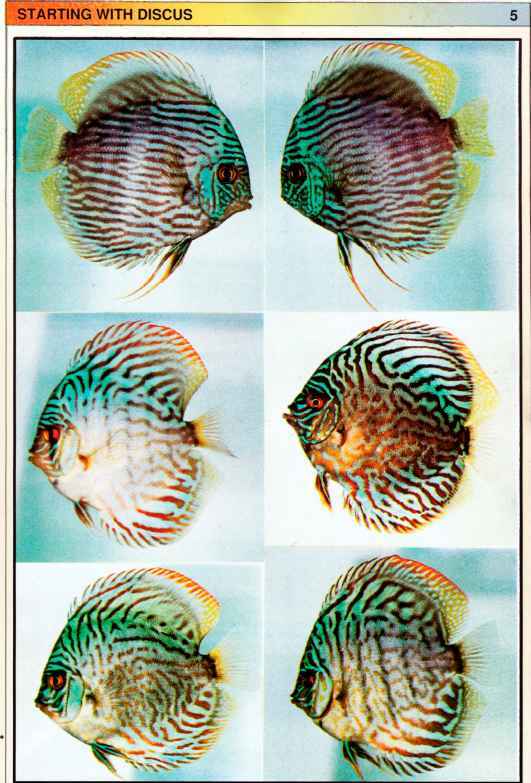 The top two photos are of Heckel discus, the remaining four are of irregular green turquoise discus. 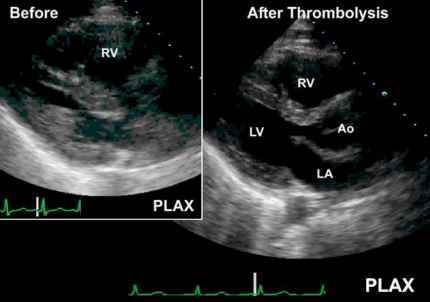 were commonly known at that time, all the more popular, as aquarisls are generally people who are intrigued by the challenge of keeping and breeding difficult fishes. Well, it turned out that discus are not really that difficult at all, but they are specific in their keeping requirements and once the aquarists "cracked the code," the discus hobby took off like wildfire. Brown discus are only rarely kept. They have been displaced by the turquoise progeny. 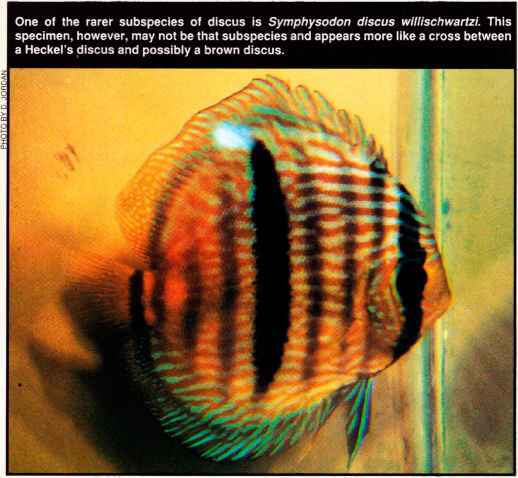 One of the rarer subspecies of discus is Symphysodon discus willischwartzi. This specimen, however, may not be that subspecies and appears more like a cross between a Heckel's discus and possibly a brown discus. A pair of Symphysodon aequifasciatus haraldiin the act of transferring their progeny from one parent to the other. The fry are feeding on the nutritious coat of slime produced by the parents for just that reason.